Well, to be honest, I didn’t get a lot (of stitching) done on Friday Night …..just a little bit to finish off the front of my placemat for our Let’s Get Stitched retreat in March, but other than that, I haven’t really done any stitching as I’ve been determined to get into my sewing room and make it respectable again!!!! I now have my design wall actually on the wall!!! and a cutting table I can actually cut on because it’s not full of ‘stuff’! …and my new sewing table fits in perfectly…..everything at hand….cutting station, sewing station, ironing station……and can you see what’s hanging under the design wall??? It’s the gorgeous Jen’s wall hanging she made for me with my new logo (which I have yet to create for the blog) .. Isn’t she just perfect????? Sometimes I think she knows me better than I know myself! Just love friendships like that…..rare, but wonderful! Harriette is sitting waiting patiently for me to start sewing too…… I really do need to slot in some sewing dates in my diary!!!! My stash of magazines got relocated from the bookshelves in the craft room, to the ones in the garage……not as many as I thought I had……but still a lot!!!! So yes, my room is expanding, despite hubby’s reluctance……. I’ll whittle away at this now I’ve got things under control! I have my squares all sorted…..
and a shelf for pretties to inspire me……. Like I said….still a ways to go……..but little by little I’m getting there…. The scraps are organised too, but like I said, still some more to go, but I’m happy in my space now…..
and the white cupboard tardis that hid a multitude of sins is now in the garage, next to the doorway to the sewing room, housing my scrapbooking gear and a bit of the bulky sewing stuff….still useful and still loved and still handy but organised! On Friday I also sent Pat S her birthday gift in our Birthday Fat Quarter Swap…..I am a little late as her birthday was January 11, but I was searching for some flannel as she wanted, which was a bit difficult up here in the tropics! Hopefully it will find it’s way to her house swiftly and she’ll love it! So if you’ve managed to stick with me until now, it’s time for the FNSI draw. 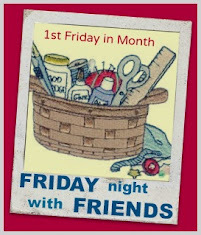 There were 61 of us stitching together on Friday night which was fabulous!!! A new year, a new start and lots of enthusiasm! Wouldn’t you just love to make that???? Now I’ll leave you with our little visitor this morning….. Thanks for the studio tour! You sure accomplished a lot! A clean cutting table is so fun!! congratulations Jeanette. enjoy your win. What a terrific Quilt Cave!! I wish I could get my scraps sorted out so effectively! Most impressive Wendy. You must have worked very hard to get everything under control like that. Great to visit your blog Wendy. Hoping to get back to FNSI after the holiday break.....sometimes gets a little busy at home with everyone here....but all good!